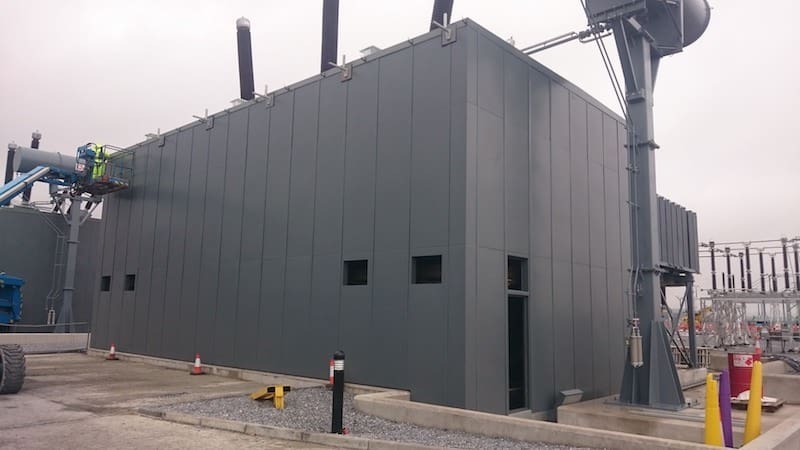 Kimpton designed, manufactured and installed two industrial acoustic enclosure projects for Siemens on their major power transmission projects in Scotland, one in Ayrshire, and this one in Blackhillock, Moray. Each site required multiple acoustic enclosures for HV transformers with sound power reductions of 18dB and 20dB respectively at 100Hz frequency. Siemens are an existing customer of Kimpton’s and approached us for this contract based on the success of similar previous work. 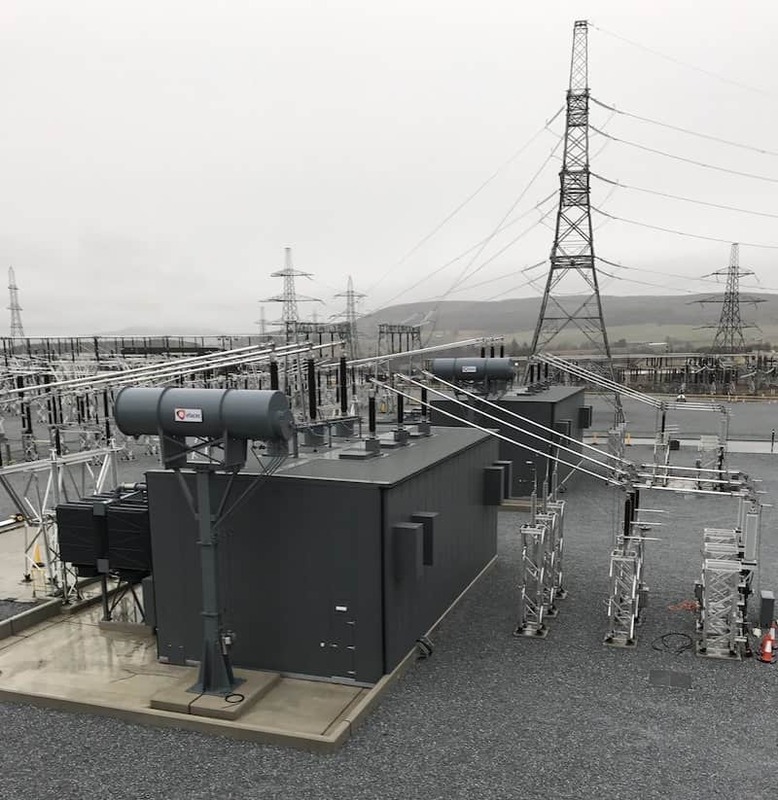 The projects were for different end user clients: Hunterston Convertor Station in Ayrshire is operated by Western Link, and Blackhillock in Moray is operated by Scottish & Southern Energy Power Distribution. 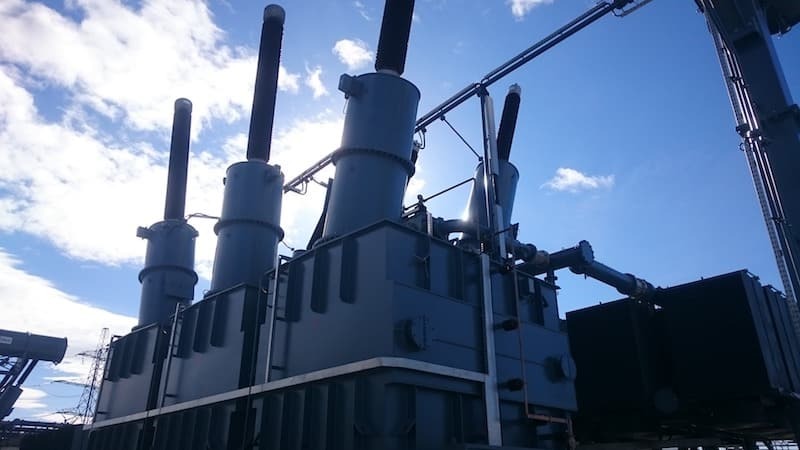 The client required the installation of acoustic enclosures for six Convertor Transformers at Hunterston, and a further six Supergrid Transformers at Blackhillock, each necessary to reduce noise levels in-line with planning conditions. Since the two sites are in remote coastal areas of Scotland and are constantly exposed to the elements the enclosures needed to be robust, but with a 40-year design life requirement to consider too, durability of the installation was paramount. While, on paper, the projects had similar requirements, they differed significantly in terms of the practicalities and logistics of implementation. Blackhillock is a relatively open site with easy access and requiring free-standing enclosures. Conversely, the Hunterston site, being an extension to a live site and close to a nuclear power plant, had extensive security restrictions and additional physical challenges imposed by the need to fit the acoustic enclosures in between the concrete blast walls of the converter station. 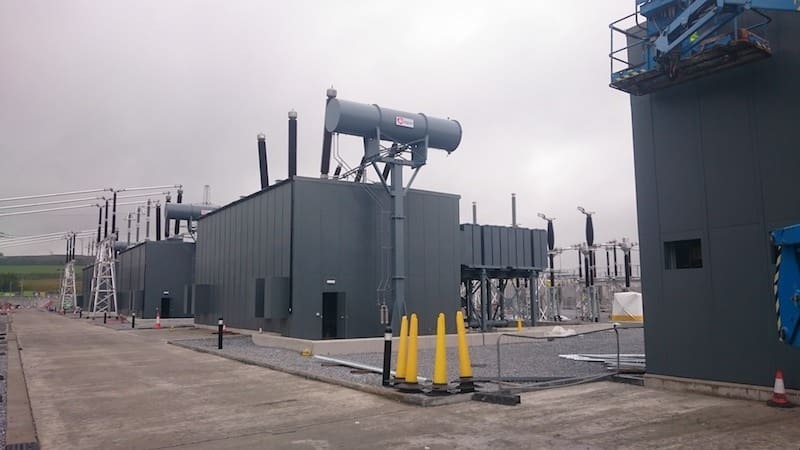 The Supergrid transformers at Blackhillock were installed onto concrete plinths, around which we designed and installed the bespoke acoustic enclosures to mount onto the surrounding bund walls. As is usually the case with off-shore power related projects, the remote locations of the sites require considerable planning to ensure each stage is completed on time and to required quality standards. Our site team worked alongside the Siemens team and their other sub-contractors, interacting with them closely to deliver the phased construction of this major project. 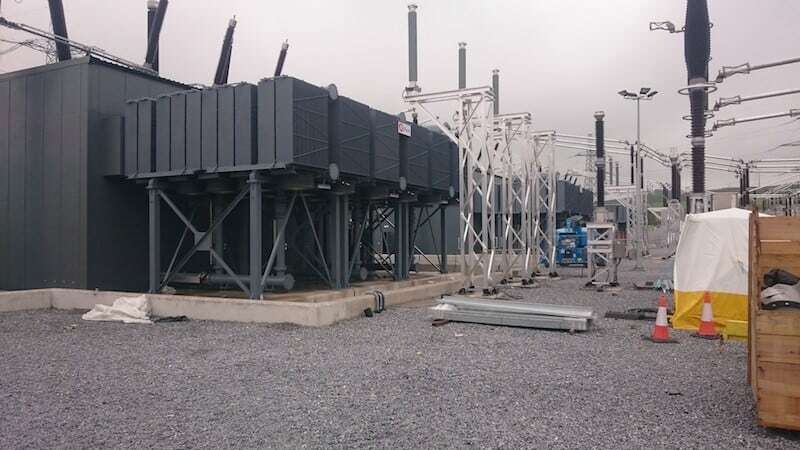 The nature of the equipment being installed and the project programme demanded that the enclosure had to be carefully constructed around the installed transformers and coolers; as well as the interconnecting cooling pipes, cabling, and HV bushings which penetrate the roof of the enclosure. The Hunterston project brief was unique for us in terms of the location of the transformers – being set between the cast in-situ concrete blast walls of the converter station building. This meant that access to each enclosure was very limited, being only possible from the front of the enclosure. A multi-pitched roof had to be designed in order to fit around the equipment contained within the enclosure while also maintaining the safe clearance tolerances necessary for the high voltage installations above. The heat load generated by the transformers within the enclosures required ventilation to be integrated into the designs to prevent overheating. Designed by Kimpton engineers, a natural convection concept was adopted to deal with the heat load, which would avoid the maintenance demand of a forced air system. The ventilation inlets and outlets were fully attenuated to prevent break out noise. In order to provide the 40 year design life in the highly corrosive marine environment at Hunterston, our engineers investigated and sourced ISO 12944 C5M paint which would be salt, sand, sun, rain and wind resistant. All of the acoustic panels were treated both on the outer face, and in the hidden cavity of the panels themselves. As this is the longest design life to be asked of an acoustic enclosure to date, the Kimpton design team needed to conduct detailed research to ensure the enclosure would withstand the test of time. In addition to exceeding the sound power reduction specification, Siemens also have an aesthetically pleasing weatherproof enclosure fully compliant to National Grid standards. The unprecedented level of complexity of the Hunterston site created unique challenges, but at every stage Kimpton’s team demonstrated their total commitment to raising the bar in delivering such specialist one-off projects for their clients. As with all Kimpton enclosures, the design itself stands out from the competition and by utilising a unique secret fix system as well as being offered in any RAL colour, the architectural aesthetics of the Kimpton design sets the standard for industrial acoustic enclosures. This, together with the wider scope that Kimpton’s can also provide through their mechanical and electrical engineering and installation teams, and civil works partners, means that a complete turn-key solution can be offered to all of our clients if required.